Well... today was supposed to be productive, and I can't say I failed miserably. Even though I had a ton of time today, it seemed to slip away. This usually seems the case but I've been hoping to just get a chance to relax and take my time getting back into the swing of the week. Nope. Monday mornings are always early, and this one was no different. Jump and Pump at 6:00 a.m. It's impressive people come. Well... they used to. This week I only had 2 participants, and one was late. It was really chilly out, and my boss told me numbers drop drastically when it's cold. He might have just been saying this to not bruise my ego... but I'm choosing to believe it's the weather. 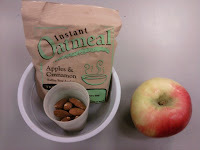 Before the class I had my apple, and after I practically scarfed down my oatmeal and almonds. Oatmeal becomes so much more appealing when it's cold outside. 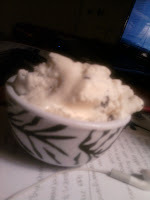 It almost tastes like an indulgence...okay that's a bit of a stretch but a big bowl of warm gooey sweet stuff is usually pretty easy to put down. 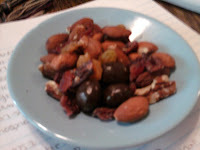 The almonds add a nice crunch and nutty flavor. Good combo, in my book. Just like clockwork, 7:00 came around and I actually resisted coffee!!! (Until 7:45) I gave in and decided it was worth it. I have to drink coffee to survive my nutrition class because my teacher is just the most worthless professor I have ever had. That's another story. Right after class I headed to the gym and as promised, I took it easy. My bad ankle/foot has been super sore lately and I stopped doing rehab months ago. Oops. Yeah. Bad. Don't ever stop doing rehab. Your body only gets older with age. Obviously, right? But seriously, it's not going to get any easier for me. I was told I have the knees of a 30 year old when I was 19. That's dimming the future a little. So I only did the elliptical for 30 minutes... and not hard. I just blazed through it at an easy pace. I spent a lot of time stretching. When you're super active, it's easy to neglect stretching but it felt oh-so-good. By then, it was lunch time. We didn't have any bread or lunch meat so I made a grocery store stop. (Three in 18 hours I think). I got my favorite bread of all time which I usually neglect because it's 120 calories a slice. I usually would recommend about 70-90 calories per slice, but this bread is just so good. It's Arnold's Oatnut. I've been a fan for about 6 years but haven't had it forever. I only used one slice for my sandwich because it's a pretty big piece. 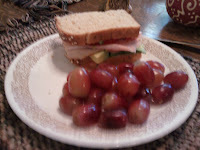 I had deli sliced ham and turkey and put avocado and tomato. I used avocado instead of cheese/mayo as a healthy fat alternative. Grapes on the side. Yummy sandwich. Okay grapes. A few hours into errands and whatnot, I got hungry and went into the cabinets for my roasted, salted trader joe's almonds. MISSING. My parents ate them all. It was a sad day. Susie did buy more trail mix though. It's alright... not my favorite. It's called Wake Up, or something like that, because it has chocolate covered espresso beans. It's good, not great. It did keep me satisfied until dinner though, and that is a feat, so I'll give it credit. So then, I needed more coffee and I didn't want to leave the house but we had no fresh stuff. I made another grocery trip and got pumpkin coffee and a pumpkin spice creamer. The coffee wasn't good! I think it was like the bottom of the barrel leftover type thing. 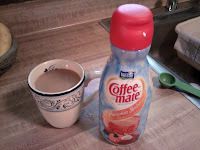 The creamer is delicious and now I realize why pumpkin coffee from Dunkin is so good. The creamer is PACKED with sugar. But it's one tablespoon and honestly, it's not going to break the bank so I go for it. I don't often say this. Dinner stunk. I was super excited for my first try at ratatouille. Let me first inform you: I didn't make it. Susie did (no offense, you're usually a good cook!). It was a flavorless blend of egg plant, zucchini, squash, onions, basil, and tomato. This sounds right up my alley. I had to drown it in Parmesan for it to be okay. And this was the "main dish." 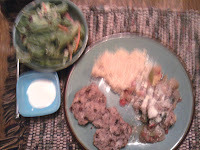 We had it with quinoa, which is really good! I've never had it before. It's a nuttier rice-type dish known for it's high levels of protein. We had really good cinnamon raisin rolls with a salad on the side. The main dish lacked but everything else was alright. Overall....not the best dinner ever.